Heart throbs Tom Hardy and Joel Edgerton star in this action filled, tear jerking and striking film, directed by Gavin O’Connor. Hardy and Edgerton star as brothers, separated by family problems and life’s ambitions. But one thing brings them together – Martial Arts. Tommy (Hardy) joins the mixed martial arts tournament for his country, holding on to his brutal past of being a Marine. And Brendan (Edgerton), joins for the huge cash prize, hoping to keep his family together, who are struggling with serious money issues. Both brothers holding a grudge on their ex-alcoholic father (Nick Nolte) , do not know that the other brother is a contestant in the tournament, and once finding out, must make the decision whether or not to fight to what is certain, serious injury.Tommy is fighting for a fight – The ultimate grudge on his own brother for deserting him. He wants revenge and the money. However Brendan is fighting for his family and their welfare. Both reasons at opposite ends of the scale, causing a new dispute between them. This film, released in 2011, to me is a brilliant film filled with intense moments which will have you sitting on the edge of your seat. The rawness and honesty of the plot gives you a shocking visual into martial arts and what the two brothers will go to to win the prize. The injuries look real, and the emotions also look real, which for me almost made me feel emotional with them. Warrior is a fascinating take on family values and money, something that causes issues to most, and take it and throws it up in the air and then kicks it to the floor. Another good point about the film to me is the actors performances and how they were able to play to fighting brothers, but still include the love that they have for each other deep down. Along with, of course, the eye candy of Tom Hardy, has his muscular physique. 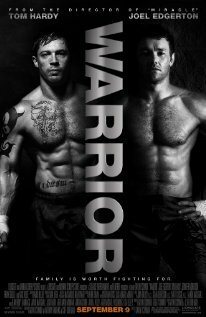 I recommend this film to anyone with a love for Tom Hardy, martial arts and intense, edge of the seat scenes.